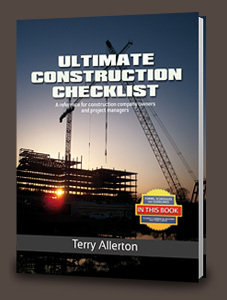 Terry Allerton’s Ultimate Construction Checklist -two Books written for use by small and medium-sized commercial general contractors as well as construction managers, building managers, and developers. Project managers will find Book One to be most beneficial…and maybe someday become Book Two customers! With these Books you can learn the secrets of construction directly from construction veteran Terry Allerton. Learn how to maximize profits, minimize risks, and streamline your projects from start to finish. Terry offers his personal insight into the many facets of the construction industry. Be sure to read the “ABOUT TERRY” page, find out more about Terry and what it was that prompted him to write these Books. The time-tested principles found in the various checklists that Terry has developed over the years have been used with great success. Ultimate Construction Checklist (UCC) will help you avoid the common mistakes, pitfalls, and outright errors that plague a construction project enabling you to avert costly problems and eliminating the time-consuming process of trial and error. The UCC is a comprehensive resource consisting of two Books. Book One is designed for project managers looking to elevate their level of professionalism and separate themselves from their peers. As a project manager take a moment to review the Table of Contents from Book One and you will immediately realize its value, not just for the checklists, but for the form letters, scheduling guidelines, meeting minute sample documents, and so much more…Your customers and/or employer will be amazed at how much more valuable you are than someone operating without all this industry proven support. Book Two is recommended for commercial general contractors and facilities managers managing construction projects. As a general contractor have you ever said “I would really like to standardize our forms or procedures,” or “wouldn’t it be great if all of our people were consistent with the academic side of our business?” As a facility manager imagine having the tools you need from pre construction through completion of your projects. Checklists for scope review for each of the (16) divisions in the (ASI) American Standards Institute to assist in a “more thorough” contract agreement. If you are looking for a company safety program or a WBE program (often required by corporate customers) look no further than Book Two. With these Books being over 2,500 pages it would cost more than the price of the Book just to type all this information. As an example it took a full time construction safety officer over two months just to write the safety program that is in Book Two. This alone would price the Book value in thousands of dollars. If you are involved in commercial construction and review the table of contents you will immediately appreciate it’s real value compared to the Book’s sale price. If you don’t immediately see it’s value please E-mail me so we can discuss your business. For your convenience, Ultimate Construction Checklist is available as both a traditional hardcover book, or in electronic format as a PDF (Adobe Acrobat). Whichever format you choose, Ultimate Construction Checklist will be an invaluable addition to your library, and your business, for years to come. Just click and look at the Table of Contents and you will realize the “Power” of these Books!